This literature review highlights a study led by George Church describing FISSEQ, or fluorescent in situ RNA sequencing. Methods such as fluorescence in situ hybridization (FISH) allow gene expression to be observed at the tissue and cellular level; however, only a limited number of genes can be monitored in this manner, making transcriptome-wide studies impractical. George Church's group* is presenting the further development of their original approach called fluorescent in situ sequencing (FISSEQ) to incorporate a spatially structured sequencing library and an imaging method capable of resolving the amplicons (see Figure 1). In fixed cells, RNA was reverse transcribed with tagged random hexamers to produce cDNA amplicons. Aminoallyl deoxyuridine 5-triphosphate (dUTP) was incorporated during reverse transcription and after the cDNA fragments were circularized before rolling circle amplification (RCA), an amine-reactive linker was used to cross-link the RCA amplicons containing aminoallyl dUTP. 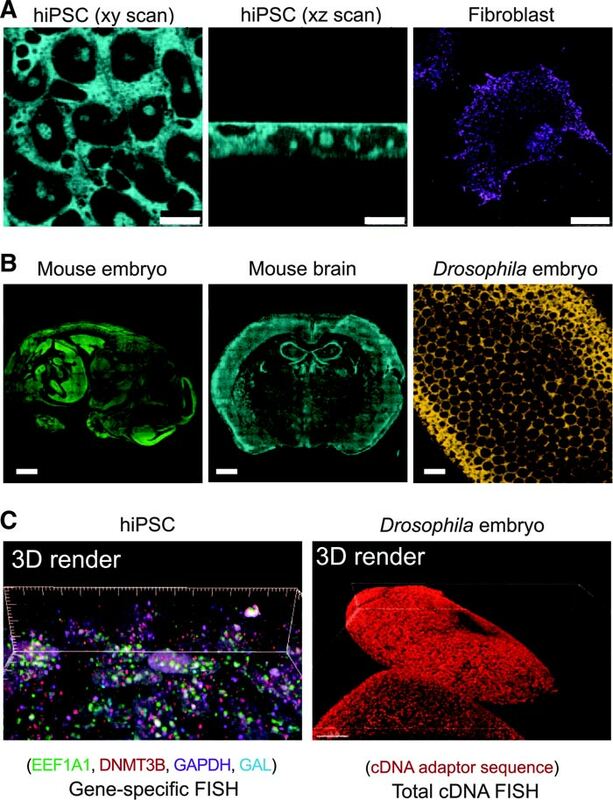 The team generated RNA sequencing libraries in different cell types, tissue sections, and whole-mount embryos for three-dimensional (3D) visualization that spanned multiple resolution scales (see Figure 1). Figure 1. Construction of 3D RNA-seq libraries in situ. After RT using random hexamers with an adapter sequence in fixed cells, the cDNA is amplified and cross-linked in situ. (A) A fluorescent probe is hybridized to the adapter sequence and imaged by confocal microscopy in human iPS cells (hiPSCs; scale bar: 10 μm) and fibroblasts (scale bar: 25 μm). (B) FISSEQ can localize the total RNA transcriptome in mouse embryo and adult brain sections (scale bar: 1 mm) and whole-mount Drosophila embryos (scale bar: 5 μm), although we have not sequenced these samples. (C) 3D rendering of gene-specific or adapter-specific probes hybridized to cDNA amplicons. 3D, three-dimensional; RT, reverse transcription; FISSEQ, fluorescent in situ sequencing; FISH, fluorescence in situ hybridization. In a proof-of-concept experiment (see Figure 2) the authors sequenced primary fibroblasts in situ after simulating a response to injury, which yielded 156,762 reads, mapped to 8,102 annotated genes. When the 100 highest ranked genes were clustered, cells kept in fetal bovine serum medium were enriched for fibroblast-associated gene hits, while the rapidly dividing cells in epidermal growth factor medium were less fibroblast-like, reaffirming that the FISSEQ platform output reflects the change in transcription status as a function of the cellular environment and stress factors. Figure 2. Overcoming resolution limitations and enhancing the signal-to-noise ratio. Ligation of fluorescent oligonucleotides occurs when the sequencing primer ends are perfectly complementary to the template. Extending sequencing primers by one or more bases, one can randomly sample amplicons at 1/4th, 1/16th, and 1/256th of the original density in fibroblasts (scale bar: 5 μm). N, nucleus; C, cytoplasm. The authors further noted that FISSEQ appears to be sensitive to genes associated with cell type and function, and this in turn could be used for cell typing. It was also speculated that FISSEQ might allow for a combined transcriptome profiling and mutation detection in situ. 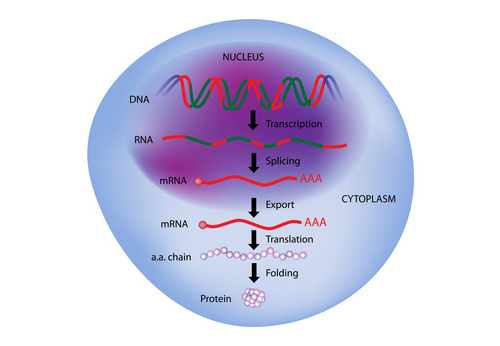 Understanding the spatial organization of gene expression with single-nucleotide resolution requires localizing the sequences of expressed RNA transcripts within a cell in situ. Here, we describe fluorescent in situ RNA sequencing (FISSEQ), in which stably cross-linked complementary DNA (cDNA) amplicons are sequenced within a biological sample. Using 30-base reads from 8102 genes in situ, we examined RNA expression and localization in human primary fibroblasts with a simulated wound-healing assay. 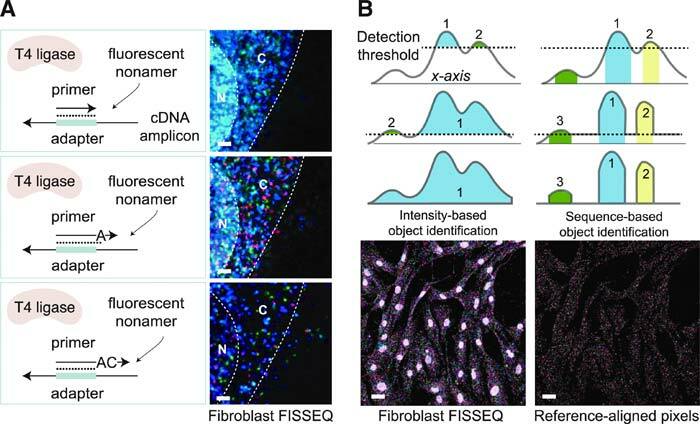 FISSEQ is compatible with tissue sections and whole-mount embryos and reduces the limitations of optical resolution and noisy signals on single-molecule detection. Our platform enables massively parallel detection of genetic elements, including gene transcripts and molecular barcodes, and can be used to investigate cellular phenotype, gene regulation, and environment in situ. ASSAY & Drug Development Technologies, published by Mary Ann Liebert, Inc., offers a unique combination of original research and reports on the techniques and tools being used in cutting-edge drug development. The journal includes a "Literature Search and Review" column that identifies published papers of note and discusses their importance. GEN presents here one article that was analyzed in the "Literature Search and Review" column, a paper published in Science titled "Highly multiplexed subcellular RNA sequencing in situ." Authors of the paper are Lee JH, Daugharthy ER, Scheiman J, Kalhor R, Yang JL, Ferrante TC, Terry R, Jeanty SS, Li C, Amamoto R, Peters DT, Turczyk BM, Marblestone AH, Inverso SA, Bernard A, Mali P, Rios X, Aach J, and Church GM.